Replacing a tooth is critical to restoring confidence, an attractive smile and full chewing function. Today you have many options in tooth replacements, and Dr. David Green of Turnagain Dental encourages you to explore your dental implant options. A dental implant is a tooth replacement that recreates the entire structure of a tooth, including its root. The implant’s post is surgically placed in the jawbone and behaves exactly like a natural tooth root. It is mounted with a beautiful artificial tooth that is designed to blend in with the surrounding natural teeth. If you are interested in replacing one or more missing teeth with dental implants, please book a consultation with Dr. Green today. Compared to other tooth replacements, dental implants have many noteworthy benefits. 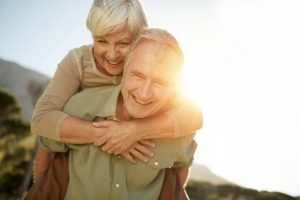 Preserve the jawbone – Since the implant post is placed in the jawbone, it provides the stimulation the bone needs to thrive. Without this stimulation, the jawbone deteriorates, which can cause remaining teeth in the mouth to loosen and fall out. Preserve a normal facial appearance – A face without teeth can start to collapse and look very sunken-in and hollow. The mouth can start to look shriveled and the face can look a decade older than it is. Implants help to preserve a normal facial appearance. Do not rely on the surrounding teeth for support – Unlike dental bridges, implants do not rely on the surrounding teeth for strength or support. The adjacent teeth do not need to be reshaped or modified in any way when an implant is placed. Can replace a single tooth, multiple teeth or an entire mouth of teeth – Implants are very versatile. The posts can support individual crowns, a bridge prosthetic or even a set of dentures. Strong and durable – Because implants are anchored in the jawbone and constructed from very strong materials, they are extremely durable and long-lasting. Very high success rate – Implants have an extremely high success rate (between 90 and 100 percent, depending on where in the mouth they are placed). Support normal chewing function – Implants allow you to enjoy all of your favorite foods, including crunchy, chewy or tough foods, without slipping or shifting around in the mouth. Increased self-confidence – Patients with implants enjoy the self-confidence and great quality of life that comes with having a complete set of attractive teeth. The process to place a dental implant usually requires multiple appointments spaced over a period of several months. 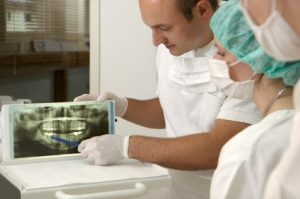 Prior to starting treatment, Dr. Green performs a thorough examination and takes X-rays to get a closer look at the condition of the jawbone. He uses this information to recommend a suitable course of action. If the jawbone is weak or insufficient, Dr. Green may recommend bone grafting to build up the bone before proceeding with implant placement. The first step of implant placement is to surgically place the implant’s post, which might resemble a small rod or screw, into the jawbone. An opening is made in the jawbone underneath the gap left by the missing tooth, and the post is placed. The post is then left to heal for several months. During this period of time, known as osseointegration, the post becomes part of the bone’s actual anatomy. A provisional crown may be placed over the post so the patient does not need to go without a tooth. Once the post has healed, the provisional crown is removed and a customized crown is affixed to the top of the post. The crown should blend in seamlessly with the surrounding teeth in size, shape and color. If a cluster of teeth or an entire arch of teeth needs to be replaced, several implant posts may be placed throughout the jaw to support a dental bridge or a denture appliance. Implants can be brushed and flossed in the same manner as natural teeth. They should be checked by Dr. Green every six months to ensure proper form and function. With the appropriate care and maintenance, implants can last indefinitely. Some patients enjoy their implants for a lifetime. For more information about dental implants, please contact Turnagain Dental and request an appointment with Dr. Green.